Unfortunately, this appears to be Black Knot, which is caused by fungal pathogen Apiosporina morbosa. Its characteristic sign is a black tar-like swelling on branches of infected plants. 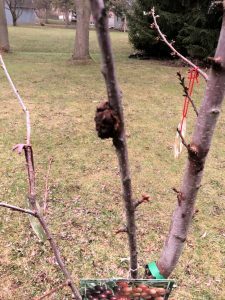 The cherry tree may have been infected for a year or more before the growth became visible this spring, when the tumor-like growth is unobscured by leaves. It takes a keen observer to notice the subtle, initial symptoms present during the first season of infection. The pathogen’s presence disrupts the normal growth of branches and a knot forms at the infection site. Black Knot spreads more quickly during warm, wet springs. The pathogen develops both internally and externally, so rigorous pruning and destruction of infected material, at a minimum, is required. This is performed in the winter, when the tree and pathogen are dormant. However, if the tree is young (and even if it is not), you may want to consider removing the entire tree since the chance of reinfection is quite high as spores in the spring are produced abundantly from the tumour-like growth and it does not take a lot of Black Knot in an area to keep a population going. Also, even a short period of wetness (only a few hours) is enough to prompt spore discharge into the air. If you choose pruning rather than complete removal, prune out galls a minimum of six to eight inches below obviously infected tissue. It is best to prune back to an appropriate point, such as a collar, rather than leaving a branch stub. Also, sterilizing pruning tools between cuts is critical to prevent spread of disease. For this, you may use hydrogen peroxide, rubbing alcohol, or a diluted bleach solution. All diseased plant material should be burned or removed from the site and should not be composted to prevent the spread of fungal spores. Note that knots are capable of producing spores for some time after removal from the tree. Cultural Management – The main strategy to lower disease incidence is the removal of sources of the disease. All shoots and branches bearing knots should be pruned out during the winter. More on this noted above regarding pruning practices. Genetic resistance – Consider selecting varieties with known resistance. Site selection – Avoid planting new trees near areas with known problems such as abandoned orchards or where wild varieties have been observed with the disease. Fungicides will not provide adequate control of black knot without proper orchard sanitation (pruning, removal, and burning of black knots). Many fungicides registered for brown rot control can help with black knot management, but only by suppressing the black knot disease. Most fungicides targeted for brown rot control will prevent 40%-50% of the potential black knot infections under high disease pressure. Where cultural controls such as pruning knots are combined with the use of fungicides, up to 90% prevention of black knot. We wish you the best of luck in the treatment or removal of your tree. If your job is a large one, considering contacting a professional arborist.